Image: Sovan Chatterjee (left) in a file photo and Mamata Banerjee inaugurating Garden Reach Flyover on Friday. Kolkata: SPECULATION is rife that Sovan Chatterjee will step down as the Mayor of Kolkata due to his dispute with wife, which has angered Trinamool supremo and Chief Minister Mamata Banerjee. 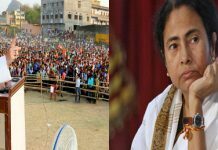 The speculation got strengthened as Chatterjee, despite being the Mayor of the city, was today absent from the inauguration of the 4.4-km Garden Reach Flyover by Chief Minister Mamata Banerjee. Chairperson Mala Roy represented Kolkata Municipal Corporation at the event. Not only this, Chatterjee also skipped a meeting of the Trinamool core committee held at Nazrul Mancha during the day. 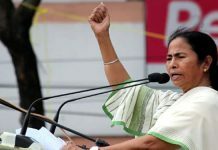 This is reportedly because Mamata Banerjee was not willing to see him on the dais for his mudslinging in the media over a dispute with wife Ratna Chatterjee. A view of Garden Reach Flyover that connects Majerhat to Garden Reach. Chatterjee, who is also the state fire services minister, had filed a divorce suit against wife in the Alipore court last November. Late last month he lodged two FIRs against wife and her friend Jhuma Saha for allegedly intruding into his Behala house and threatening his personal assistant. 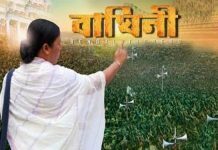 Sources claimed that soon after this, Ratna Chatterjee met Mamata Banerjee and narrated her ordeals to her that includes alleged extra-marital affair of the Mayor and physical assault on her. This left Banerjee angry and she asked senior Trinamool leaders to ask Chatterjee stay off her.